What do you call a Shepherd’s Pie topped with fresh homemade biscuits instead of potatoes? Is it still a shepherd’s pie? Or is it now a pot pie? How about a Biscuit and Vegetable Pot Pie? Whatever you want to call it …. I call it DELICIOUS! Ooooh! Can anyone say Ultimate Comfort Food? This might be one of those dinners you make to impress your omni-friends. You know the ones. Those friends and family members who think we are all SOOO deprived? Eating nothing but Tofu and Bean Sprouts? This recipe will show them how sadly mistaken they are! Healthy, low-fat, high fiber, protein-rich, and DELICIOUS! I’d say we eat pretty good – wouldn’t you? Before we get started, I just want to brag for a minute. Both of the pictures you see were taken in my usual setup. I normally try to snap a few Smartphone Photos right after I cook (and the food gets devoured), but by then it’s usually dark outside. And Oregon Winters are known for being dark, dreary, and grey – and that’s in the daytime! So using my newer dSLR Camera has been pretty much impossible. Thanks to YouTube, (and Home Depot), I think I found a solution! I bought two of those little clip on shop lights (the ones your hubby uses to work on the car), and 2 extra bright Daylight CFL Bulbs. I stretched an old T-Shirt over both domes to diffuse the light, and also picked up a couple of white foam boards to use as reflectors. Bam! Instant daylight. The photo on top was taken with my Nikon and the one just above with my smartphone. Both photos (to me anyway) are way better than I could have taken otherwise, especially at 7:00 at night. What do you think? Better? Worse? Too much light? Please let me know while I continue to adjust my setup. Like I’ve said before, I am NOT a professional photographer. I’m learning as I go. As always, thanks for any and ALL comments! I love hearing how much you and your family enjoy my recipes. What do you call a Shepherd's Pie that's topped with Flaky Biscuits instead of Mashed Potatoes? Is it now a Biscuit Pot Pie? I call it DELICIOUS! Add Lentls. Note: If you omit the wine - you may not need the lentils. Judge by the amount of liquid you have and if it has thickened or not. I used wine in my dish so added the Lentils to help absorb it. This will increase your cooking time by at least 20 minutes. 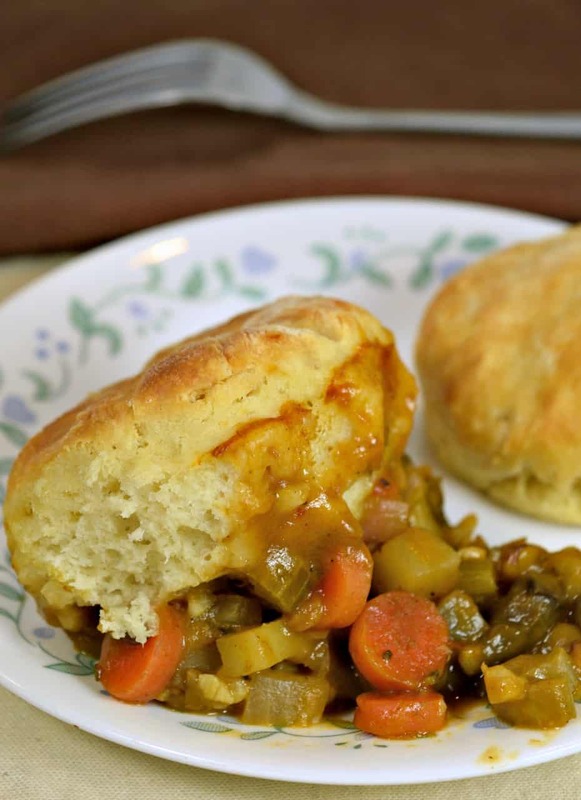 Turn off heat and let stew cool so we can prepare the biscuits. 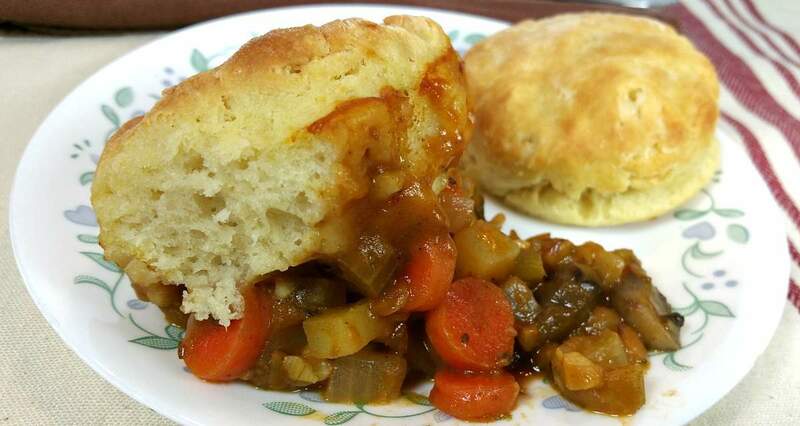 Click here for the Fluffy Buttermilk Vegan Biscuit Recipe. This looks yummy! I wonder if there are any prepared biscuits that could be used instead of making your own. I am not that ambitious. there’s no instructions when to add the potatoes? Whoops – and thanks. No one has noticed I guess until now – nice catch. Add them when you add the broth and wine. Thanks! 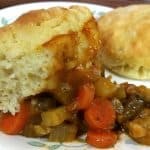 We’ve been making a couple of your recipes weekly and have enjoyed every one! !